Automated Installation Script The automated wizard does all the heavy lifting for you. Just a few clicks and you are on with your favorite project management software. Manual Installation Script For the tech genius inside you to get your hands dirty to set things up from the scratch. Follow the instructions to for the installation. *Note: This script will not work on shared hosting, only works on Ubuntu-16 & Ubuntu-18, CentOS 7 and Debian 9 dedicated servers only. *Note: If Gmail ID is used for SMTP configuration, make sure to enable the "less secure app" function. You can do this by logging into the gmail account and go to "My Accounts" then click on " Sign-in & Security" and enable the "Allow less secure apps: ON". 2What does the installation package help with? Installs MySQL Server, creates database and configures user for database or create database in an existing mysql setup and configures user, requires existing root password. 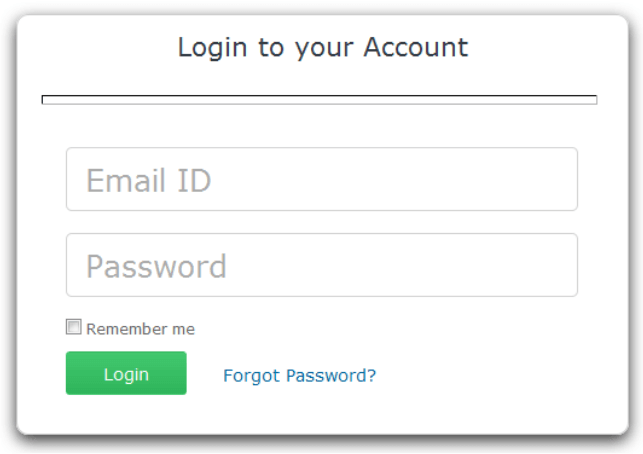 Re-enter the password as per the above given screen-shot. It will install all the required packages and dependencies and will ask for email ID, Database Name, Database User Name, Database Password and Domain name or IP address for the Host. 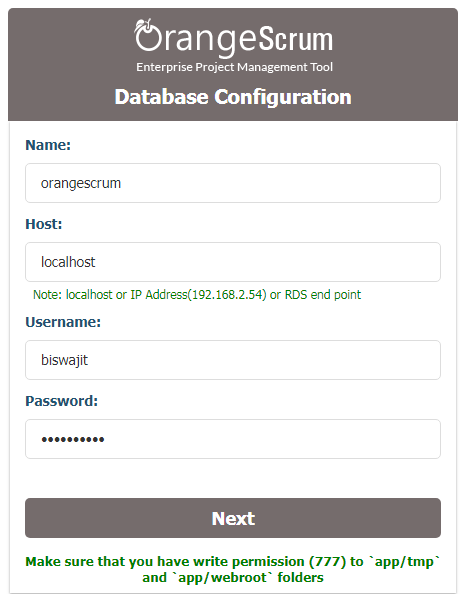 The database details you will enter on step 10 are displayed as shown below which you need during the Orangescrum Installation wizard. Run Orangescrum as http://yoursiteurl.com/ from your browser. If Orangescrum is hosted on local network, then run http://localhost/orangescrum-master or run the IP/domain as configured. 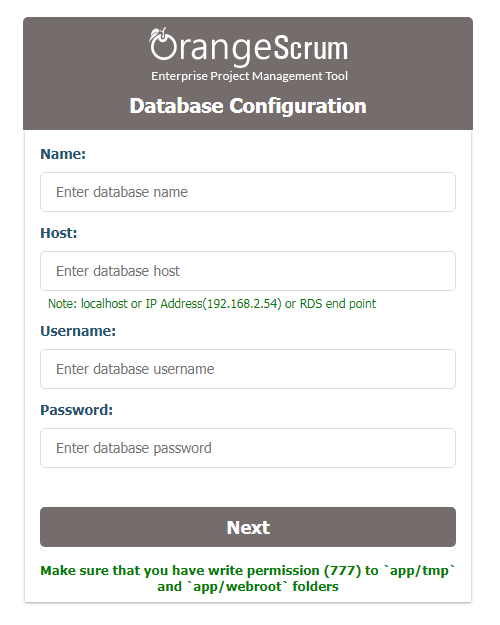 On the Database Configuration wizard, provide your Database Name, Database Host, Username, Password and click Next button. 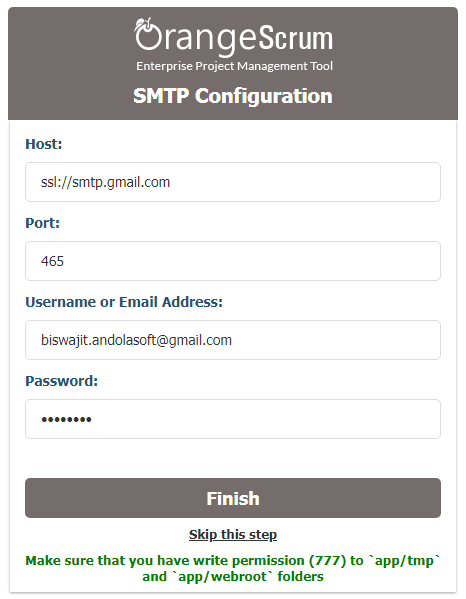 On the next page SMTP Configuration Wizard, configure the SMTP with Host Name, Port, User Name and Password. *Note: You can Skip SMTP setup by clicking on "Skip". Also, this step doesn’t verify your SMTP configuration. Follow the SMTP troubleshoot to fix the SMTP/Email invite issue. Once you click on "Finish" button, you'll be asked to provide your Company Name, Email address and a Password to login and start using Orangescrum. 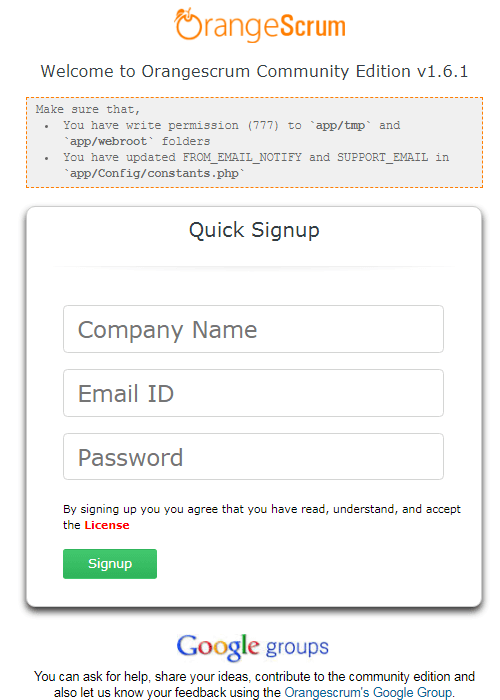 *Note: If you're unable to see the Sign up page, then change the "Configure::write('debug',2)" to "Configure::write('debug',0)" or vice-versa in app/Config/core.php. Once the sign up page appears, change the debug value to "0" and save it. Just 5 simple steps to start using Orangescrum in your premises. This procedure is well tested on Windows, Linux and Mac operating system. Extract the archive. Upload all the files and folders to your working directory. Provide proper write permission to "app/tmp" and "app/webroot" folders and their sub-folders. Make sure that, there are three .htaccess files. One in the root directory, another in the "app" directory and the last one is in the "app/webroot" directory. Make sure that, the .htaccessis working in your server. Provide your valid Gmail ID and Passwordfor SMTP email sending Or, you can use Sendgrid or Mandrill. SUB_FOLDER -Update the folder name, If your application URL is "http://www.myorangescrum.com/folder_name/" (the value should follow by a forward slash. e.g. define('SUB_FOLDER', folder_name/')). Leave it blank If your application URL doesn’t have an additional folder path. Note: You can Skip SMTP setup by clicking on "Skip". 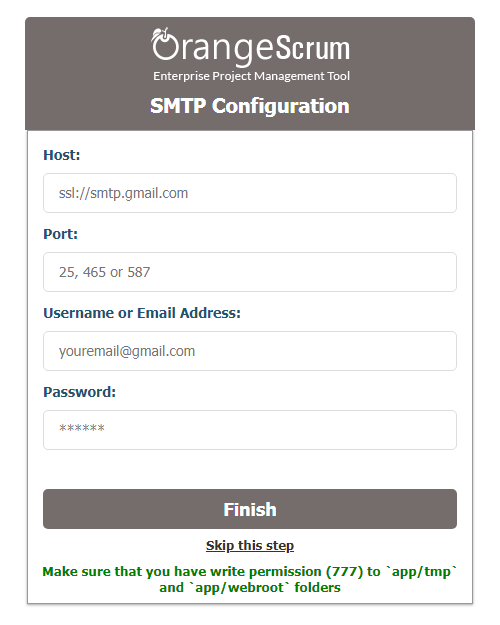 Also, this step doesn’t verify your SMTP configuration. Follow the SMTP troubleshoot to fix the SMTP/Email invite issue. Once you click on "Finish" button, you'll be ask to provide your Company Name, Email address and a Password to login and start using Orangescrum. Note: If you're unable to see the Sign up page, then change the "Configure::write('debug',2)" to "Configure::write('debug',0)" or vice-versa in app/Config/core.php. Once the sign up page appears, change the debug value to “0” and save it. 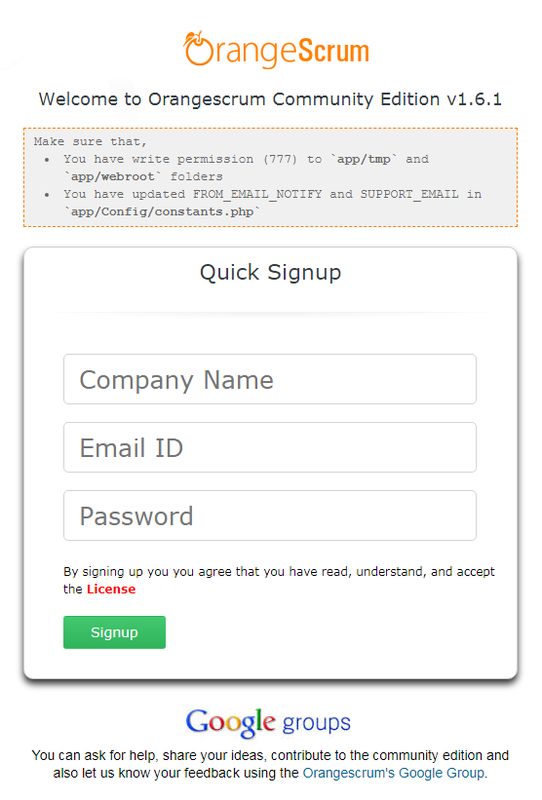 Create a Google Project (https://console.developers.google.com/project) for Google Login, Invite Google Contacts and Google Drive file attachment. Create a Dropbox App (https://www.dropbox.com/developers) for Dropbox file file sharing. Provide the S3 Bucket Names, awsAccessKey, awsSecretKey values. Get the "DropboxandGooglSetup.pdf" on the root directory of the Orangescrum project folder to know, How to create apps and projects on Dropbox and Google Drive. All the task created/updated notification email will be sent from FROM_EMAIL_NOTIFY. When somebody will reply on that task created/updated notification email, the FROM_EMAIL_NOTIFYwill get that Email in the inbox. EmailReply.php page is going to read the emails from FROM_EMAIL_NOTIFY and It will post to them as a reply to the respective tasks in Orangescrum. After this setup, you can reply to a task created/updated notification email and that email reply will be posted to Orangescrum under that Task. This will help you to respond to a task while on-the-go from your Mobile. Enable extension=php_imap in your php.ini file. Now enable the "NODEJS_HOST" with your server details under "define("NODEJS_HOST", '');"[ex: http://your IP address:3002/] on "app/Config/constants.php"
*Note: At any point you can change your database credentials i 'app/config/database.php' page. You will get the below output, if the SUB_FOLDER in the constants.php file is not set properly. Ex. Let your sub folder is "orangescrum-master". You can ask fo help, share your ideas, contribute to the community edition ans let us know your feedback using the OrangeScrum's Google Group. Note: If you're unable to see the Sign up page, then change the "Configure::write('debug',2)" to "Configure::write('debug',0)" or vice-versa in app/Config/core.php. Once the sign up page appears, change the debug value to "0" and save it. You can ask for help, share your ideas, contribute to the community edition ans let us know your feedback using the OrangeScrum's Google Group. *Note: This script will not work on shared hosting, only works on CentOS dedicated server only. *Note: If Gmail ID used make sure to enable the "less secure app" function. You can do this by logging into the gmail account and go to "My Accounts" then click on "Sign-in & Security" and enable the "Allow less secure apps: ON". If SELinux is installed and enabled, please set it to permissive mode. Give permission to the script file "setup.sh"
It will install all the required packages and dependencies and will ask for email ID, Email Password, SMTP mail server address and SMTP port, Domain name or IP address for the Host. *Note: This script will not work on shared hosting, only works on Debian 9 dedicated server only. *Note: Make sure to white list the application server domain/IP address from the private Mail Server. *Note: This script will not work on shared hosting, only works on Ubuntu-14 and Ubuntu-16 dedicated servers only. *Note: If Gmail ID used make sure to enable the "less secure app" function. You can do this by logging into the gmaiSign-in & Security" and enable the "Allow less secure apps: ON". *Note: This script will not work on shared hosting, only works on Ubuntu-18 dedicated server only.